Our little family is a bit patriotic, which I know isn't cool or hip, but we really don't care. Patriotism was modeled in Travis' home (his father was a Marine, his uncle in the Navy, and his grandfather in the Army). I've always been one to choke up a bit during 4th of July parades and while reading the Declaration of Independence. It's not surprising then, that when Travis and I saw the movie American Sniper in the theater we were both really impressed with the film and impacted by its message. 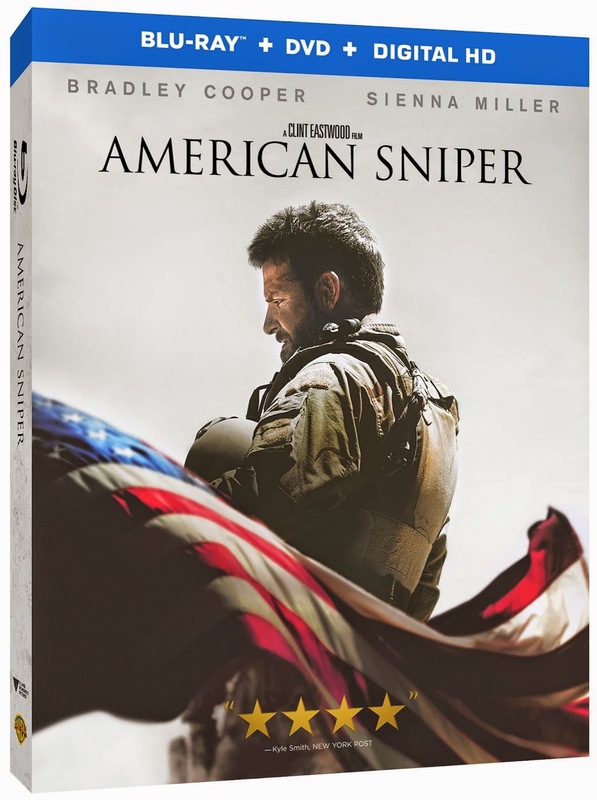 If you're not familiar with it, American Sniper is about Navy SEAL Chris Kyle, portrayed by Bradley Cooper, who served four tours in Iraq. His accuracy as a sniper saves countless lives and makes him a bit of a living legend. However, when he comes home it is obvious that he is suffering from PTSD. The movie was incredibly intense at times but it definitely helped me appreciate what our friends and family experienced while overseas. Because we liked the movie so much, and because of our patriotism, I jumped at the chance to partner with Grace Hill Media to give one copy of American Sniper to a blog reader AND to give one copy to any veteran or active duty military member I choose. I instantly knew who I wanted to give the movie to: my friend Kim and her husband Matt. Kim is an officer with the Illinois Air National Guard and has served since 2001. Her husband Matt was Active Duty Air Force from 1999-2004 and joined Illinois Air National Guard in 2004. He's been to Korea, Afghanistan, and Iraq. He's also been flown in to help with communication efforts for Hurricanes in LA and TX. Also, Kim makes really good desserts and baked goods. So she and Matt get the one copy, but that still means there's one more copy for me to giveaway. Enter via Rafflecopter and good luck! And if you are serving or have served, or are the spouse of someone who is serving or has served, please let me take a minute and say THANK YOU. I know those words aren't really enough but I mean them. My uncle, brother in law, and grandfather! My dad, grandpa, cousin.. The movie is an excellent portrayal of what they encounter, while serving and when returning home. A friend I had known since we were 4 was killed in Afghanistan in 2011. Sooo this movie made me cry extremely hard, but it's such a good one! Unrelated to the post, but it's the 15th and I often think of Peter on the 15th. An extra prayer for your family today! My Dad served as an Army pilot in Korea and didn't meet me until I was 9 months old. My brother also served in the Army. We have 4 nephews who have served or are currently in the Air Force and Army; one was delayed to the Middle East at least twice, including Somalaia. All of my uncles were in WW II as well as my father-in-law, we have a young friend who was deployed twice to Afghanistan and is now in the National Guard. We are grateful to them and proud of them. My dad is a veteran and I (obviously!) love him. He served in Vietnam. My BIL is active duty and my grandpa served in WWII- I'm so proud of them both! One of my closest friends from high school joined the Navy. He has been all over the world, and has brought me back shirts from a few places. My father is a veteran and an amazing man! I actually don't have any close family who serve in the military but my father-in-law works for the federal government in Veteran's Affairs. The stories he tells of the amazing men and women who served our country are so beautiful. My grandfather served in the Navy in WWII, and my father-in-law served in the Army in Vietnam. Thank you to all our veterans and active duty military and their families!! My dad served in the army in WWII , and one brother served in the Army and the Army reserves and a brother ad sister in the Air Force. My nephew served in the Marine reserves, and my niece went to West Point and served in Iraq. All of them are pretty awesome! Bonnie left you a crazy long comment...not sure if it disappeared....or if you moderate them. Thx for the opp to win AS!! Oh my gosh, I wrote tons about him and then when I hit publish it all disappeared! He was 49 when I was born in 1965----youngest of 5 kids.The best daddy ever. Still miss him every day, he passed away in '93 and never spoke of the war except of course through and about the good friends he had who he still maintained contact with until they gradually began to pass away/decline in the late 80s.....that's around the time he became ill too. Thanks Bonnie, also for the Creedo button--I added it to my blog. My grandfather, and my great grandfather. Such a powerful movie. Hugs to you. Thanks, Bonnie! I've been dying to see this movie! I have two active-duty brothers-in-law and a close girlfriend who is about to wrap up her active duty as an AF flight nurse (her husband is a marine officer and, due to their respective deployments/stations, they've had to spend their first year of marriage apart!! Can you imagine? But they're such champs and somehow don't complain...). My grandpa was in the Air Force and is a Vietnam Vet. I have other family members that were enlisted as well. My husband is a veteran and he absolutely loved the book. He really wants the movie! Lots in my family - three grandfathers, my dad and both of my brothers! Both of my grandpas are veterans! Thanks for the opportunity to win this movie.